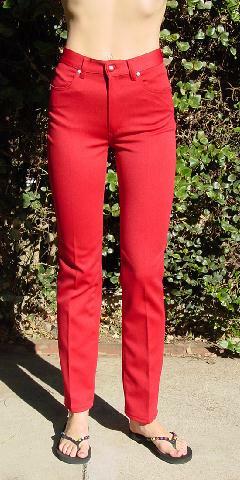 These 100% polyester byblos blu red pants have a jean styling and were made in Italy. They have a front 5 3/4" zipper, a 1 1/2" wide waistband with a red logo button, and belt loops. They have 4 pockets with 2 silver-tone metal logo rivets on each pocket. 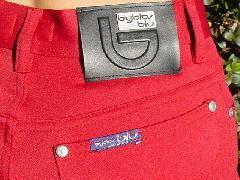 There is a byblos blu tag on the back right pocket and a black logo back waistband label. The tag says it's a 26" waist, but it's a bit smaller than that. They're from a stylist's collection, and were used in a magazine photo shoot with a white Fendi tank top and a white leather varsity style byblos blu jacket.